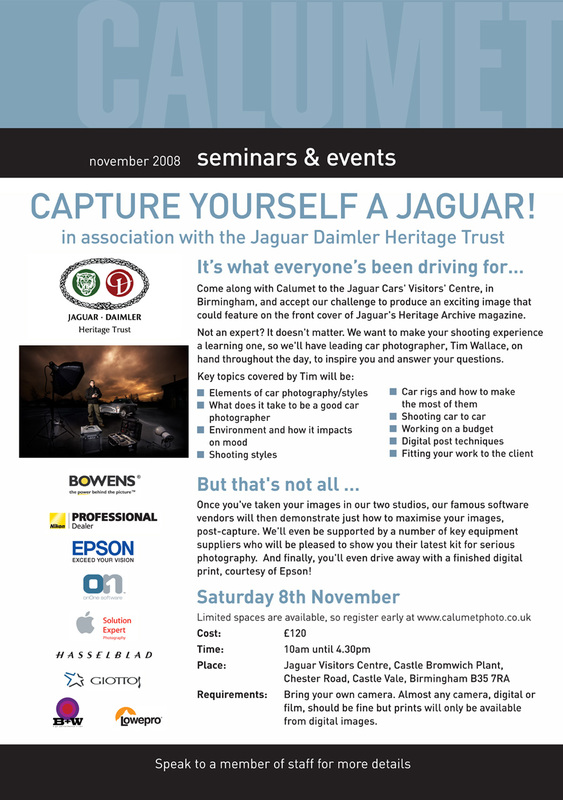 We are pleased to announce that photographer Tim Wallace has agreed to stage a seminar for Jaguar later this year at the main Jaguar Centre at the Jaguar Plant in Castle Bromwich. He will be talking about many different aspects of automotive photography as well as conducting demonstrations and giving a visual presentation of commercial automotive work. The event will be split into two separate dates, the first being in early October where the event is geared solely to degree students where as the second in November will be working with a professional audience. Tim has been working with Jaguar and other supporting companies to try and ensure that the day is as informative and fun as possible. There will be two main studio's where attendees can shoot with the supplied and their own equipment, and at the end of the day Tim will be judging the work on behalf of Jaguar in a informal competition to come up with the over all best shots from the day. The event is being supported by all the key suppliers in the field of professional photography such as Hasselblad and Nikon who will both be providing high end equipment for demonstrations. Tim- "I was asked if I'd head up this seminar a few months ago with Jaguar, I'm pleased to say that the event is now really taking shape with all the key manufacturers in the professional arena being involved, it's a great opportunity to hopefully inspire others interested in the field of automotive commercial work and really talk about what this sort of work involves in a professional capacity."